Welcome to a land of fantasy, where everyone gets along! Just kidding. This is Arcadia! Every Guild for themselves! Luckily, some new (really big) friends are joining the fight for fame, fortune, and Arcadia’s well-being in Arcadia Quest: Riders, an all-new expansion for the Arcadia Quest line of games. Guilds will now be able to recruit Mounts to their team, helping them get around the map and offering unique abilities while fighting the all new threat: Malkhor, a hunter with an eye for big game. But we’re not going to let him take our big, beastly buddies (even if it means working alongside other Guilds once in a while). Our first flash Kickstarter is now live and running until May 25 at 8 PM EST. Unlike our normal Kickstarter projects, we’re only offering Arcadia Quest: Riders for a short amount of time with some cool, exclusive extras that will be available from the start of the campaign. Running a shorter campaign and removing stretch goals by offering all exclusives from the beginning helps ensure fast delivery of the game to our backers! 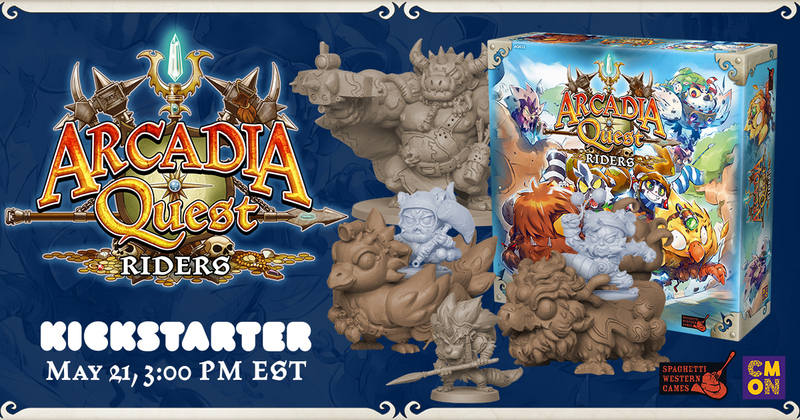 Back the Arcadia Quest: Riders Kickstarter here. Follow the CMON and Arcadia Quest Facebook pages for updates. Learn more about Arcadia Quest: Riders here. Learn about the New Friends in Arcadia Quest: Riders here. Learn about the New Adventures in Arcadia Quest: Riders here.